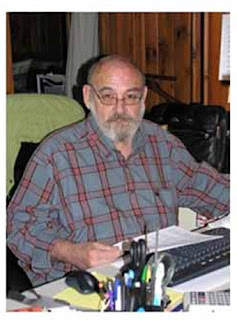 Chuck died at Cape Cod, USA, on March 28th. 2013 He will be greatly missed by all who knew him personally, including those who remember him from his attendance at the Carden Gathering in Cheshire in 1998. He will also be greatly missed by those who corresponded with him about Carden history,and by readers of his book CARDEN IN AMERICA which I am proud to have helped him publish. Only six weeks ago he wrote "I thought I would be sending the 2nd edition to you by now, but as you can see from the attached photo I had a slight accident." The picture alongside is reproduced from the back cover of his book. For more about the book see post below dated 19 March 2012.